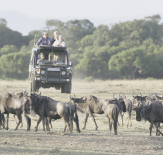 While classic ‘game driving’ is certainly one of the main things we do, there is an incredible number of other activities to choose from while on a safari. We include walks whenever we can, whether just a short meander from camp or a longer trek to a favorite sundowner spot. Hiking to the mountain gorillas or chimpanzees is a life-changing adventure, and Howard has climbed both Mount Kenya and Mount Kilimanjaro with guests. Horseback riding, camel trekking, fishing, and hot air ballooning are also very popular. We often choose boutique lodges and tented camps with swimming pools and small spas, as well as mountain biking and the occasional clay tennis court. We also carry a volleyball, soccer ball, and frisbee on our trips, and Howard and the crew are always up for a game before tea time! On most of our safaris we visit the Amboseli area, and we spend considerable time with the Maasai community there. Ker & Downey has a long history with this special community, and Howard’s long relationship with Solomon Ole Lenkaja makes this a unique experience for our guests. From visiting Solomon’s own house and family, to dancing around a fire started with two sticks and some dried-up elephant dung, to participating in our own version of the olympics – Maasai style, our guests always come away from this place astounded beyond words.